I started the UKVI model portfolio back in March 2011 to show that the UKVI stock screen and investment strategy work, and also as a way of teaching investors how to use them to pick stocks in the real world. Since then the portfolio has grown from zero to 26 holdings, with a total of 32 buy decisions, 6 sell decisions and 89 dividend payments. The portfolio began with £50,000 of virtual money and tracks every buy and sell decision, including any associated stamp duty and trading commissions. Each trading decision is announced before a trade is made, and the process behind that decision is fully documented. Because I think this is a sensible way to invest, I have the vast majority of my own pension funds invested in all the stocks in the model portfolio. So although this is a model portfolio I take it as seriously as I would my own money, because it effectively is. High Yield – The portfolio should always have a yield higher than the FTSE All-Share. High Dividend Growth – The portfolio should grow its total dividend faster than the FTSE All-Share, whether dividends are withdrawn or not. High Capital Growth – The portfolio should grow its capital value faster than the FTSE All-Share, whether dividends are withdrawn or not. Low Risk – The dividend income stream and capital value of the portfolio should be not be significantly more volatile than those of the FTSE All-Share, and each company in the portfolio should be a relatively “low risk” business. Low Effort – The portfolio should be easy to manage, taking no more than a few hours each month to make any trading decisions. Fully Transparent – Everything about the portfolio should be open and transparent, from the stock screen to the investment checklist and more. 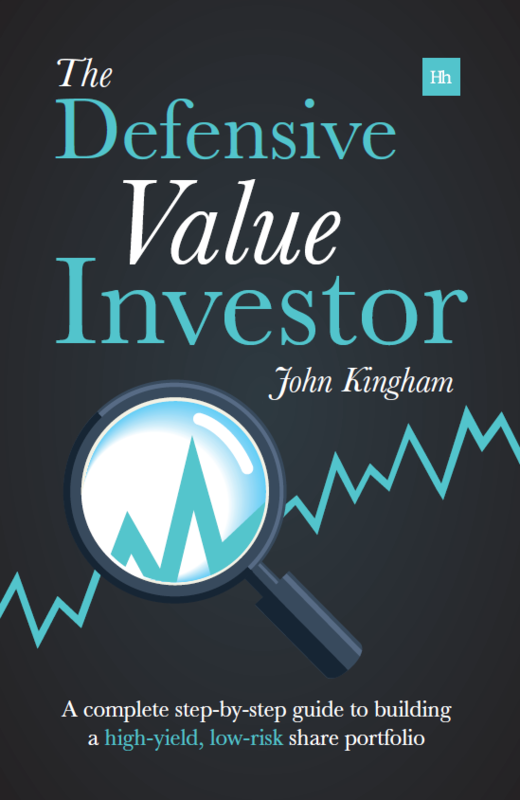 The portfolio follows a defensive value investing strategy, which means that it follows the guidelines for defensive investors laid down by Ben Graham, who was Warren Buffett’s mentor. Graham said that the defensive investor should focus on companies that are large, prominent and conservatively financed, with a long record of dividend payments. He also said these companies should be bought when the share price was reasonable in relation to the company’s average earnings over previous years. Finally, he said that shares of growing companies were preferable to others, if purchased at a suitable price. In summary then, the approach is to look for reasonably large, profitable, dividend paying companies that are growing consistently, and to buy them when the price is low relative to historic earnings and dividends. I think it’s important for an investor’s portfolio to have a benchmark, otherwise how do you know if you’re doing a good job managing your money? Low target (Aberdeen UK Tracker Trust minus 6% per year) – Pete Comley produced a detailed review of active, private investor performance in his book, Monkey with a Pin. Pete found that active, private investors were losing anything up to 6% per year when compared to market indices. Therefore, the portfolio’s first target is to beat most active investors, which in this case means having better annualised returns than 6% less than the Aberdeen UK Tracker Trust, which tracks the FTSE All-Share. Medium target (Aberdeen UK Tracker Trust) – An idealised passive investor of UK stocks might well decide to invest in the Aberdeen UK Tracker Trust as it tracks the whole FTSE index. They would buy it and hold it forever and therefore get exactly the returns from this trust. Most investors don’t even meet this target, and academia generally implies that it can’t be beating without luck or taking more risk. I disagree, so this is the portfolio’s second target. High target (Aberdeen UK Tracker Trust plus 3% per year) – This is the target that I think is reasonably achievable over time. Why 3%? It’s somewhat arbitrary, but investment returns come from three sources: dividends, earnings growth and changes to valuation ratios like the PE ratio. I think that over time the UKVI model portfolio can achieve an additional 1% each from higher dividend yields, higher earnings growth rates and from buying low and selling high in order to capture positive changes to valuation ratios. Note that Neil Woodford, the much celebrated fund manager, has achieved 12.6% compound total returns over the past 25 years with his Invesco Perpetual High Income Fund, compared to 8.9% from the FTSE All-Share. That’s a 3.7% annual outperformance for 25 years, after fees of course. So 3% outperformance for the UKVI model portfolio seems like a difficult, but achievable target. The portfolio has been running now for 28 months. One of the biggest problems that many investors have is getting their heads around the idea that investing is a long-term activity, and that it can only sensibly be measured over periods of many years. Generally 5 years is seen as the minimum period for review, but realistically it should be closer to 10. However, not everybody wants to wait 10 years before comparing themselves to their benchmark, and so you can see the total return results below. The easiest thing to measure in the short-term is dividend yield. Currently this is 4.6% for the model portfolio compared to 3.2% from the index tracker. This is in line with the main target of beating the market yield by 1%. Another useful feature to measure in any portfolio is dividend growth, because dividend growth ultimately drives capital growth. In this case, with dividends reinvested (which boost growth of future dividends), the model portfolio has grown annual dividends by 24.6% in the past 11 months, while the index tracker has grown dividends by 10.3%. Total return from a portfolio is another easy thing to measure, but it is hard to draw conclusions from total returns in the short-term. Woodford’s record is so impressive precisely because it is so long at 25 years. However, in the two-and-a-bit years that the model portfolio has been running it has matched, remarkably well, the FTSE All-Share, despite holding less than 30 stocks compared to the 600 or so in the index. To date the total returns are 22% compared to 19.1% from the index, which is an annualised return of 8.9% and 7.8% respectively. So far then the model portfolio has beaten the market index, which is good. But in all honesty, it’s over such a short period of time that random share price volatility will still be the dominant factor. Still, it’s good to be a long way clear of Pete Comley’s “minus 6%” benchmark. In terms of volatility the portfolio appears to be no more “risky” than the FTSE All-Share. Relatively low volatility is important because the fear caused by excessive volatility is one of the major reasons why most private investors underperform the market so badly. Unfortunately there is no way of knowing exactly how the markets or any given portfolio will perform in the future, but there may be a hint in the performance of past trades. Ultimately a portfolio’s performance must approximately match the annualised performance of the stocks that have been bought, held and sold over the years. These stocks were mostly sold when valuations were no longer attractive, and over time the average holding period is expected to be around five years. When you’re reviewing your portfolio it’s critical that your portfolio has goals and targets, and that you have realistic and appropriately long-term expectations for both your performance and your portfolio’s performance. It’s also important to build a portfolio which is appropriate to you in terms of income, growth, risk and the effort required to maintain it. I will start with what was good: you have lower volatility than the benchmark. Following your posts for a while I have realised you sell well too fast, you don’t believe people will overpay for your stock. I have the feeling you sell too often too. Keep a record of your sell decisions, why you have done it and see in hidsight what happened. Sometimes it pays to hold a bit longer. Buying early and selling early are occupational hazards for value investors, and I’m happy to own up to that along with Buffett and many others. And I certainly don’t want to wait for a stock to become overvalued before selling it. I’d rather buy low and sell at a normal level rather than buy low, hold at normal valuations and hope to sell high. As for selling too often, I’m not so sure. The portfolio has sold six stocks in two and a half years, which is about 20% of the portfolio. In the longer-term I expect to turn over about 20% of holdings each year, which is well below the average of 80-100% seen in most professional funds and, anecdotally, private investor portfolios, so I’m quite happy with my selling frequency too. I have only one remark: Warren doesn’t sell at all his positions and I belive that as he holds companies that have such commercial advantages he could only be right. I still own the BAT shares I bought in 2001. Funny enough at that time I didn’t know about diversification. 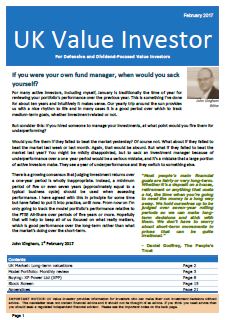 With regard to benchmarking, why not compare yourself to a fund that is attempting a similar strategy to yourself? For example, the state Street ETF UK dividend aristocrats comes to mind. That’s something I’ve thought about before, but I don’t want to drown in benchmarks! My basic position is that as an active UK investor I have the luxury of tilting my portfolio towards income or growth as I see fit, or adapting it to any particular ethical constraints that I may have. That’s a big advantage over just investing passively. But I don’t want that flexibility to cost me anything relative to the passive approach (and certainly not the 6% that most active investors miss out on), so I think active investors should first and foremost aim to at least match (and preferably beat) a size-relevant UK index, which for this model portfolio is the FTSE All-Share. But you’re right, it does also make sense to look at other funds, trusts or ETFs with similar strategies, which is why I keep an eye on Neil Woodford. Our approaches and goals are similar, and if I or anyone else using my investment tools can get close to his long-term track record, I’ll be very happy. I like how you’ve explained the simplicity of Graham’s approach and taken is as the basis of the portfolio. You have the double advantage of dividends and large companies who as Graham stated, will have sufficient talent within their organisation and cash to solve any temporary difficulties that would have contributed to their share price decline. Hi David, nice to hear from you again. In the end it’s all fairly simple. You just have to not be your own worst enemy by over-trading, buying high and selling low. I agree with the dividend growth at reasonable valuations approach. However if a company suddenly cuts its dvidend do you always sell/ avoid it? For example Aviva or Halfords. Hi Andrew. My screen excludes companies that have missed a dividend in the last decade, but includes those that have previously cut. I don’t think dividend cuts are the end of the world. To only buy companies with a 100% dividend growth track record is very restrictive and I prefer to have the option of investing in more cyclical businesses when the price is right. If a company I own cuts the dividend then I don’t automatically sell. The market is pretty efficient so in most cases the cut is immediately followed by a fall in the share price, and so I don’t want to lock in a loss. I don’t have any research to hand, but from memory buying after a cut tends to outperform over-time, which implies (if it’s true) that holding after a cut is better than selling and hoping that the next company won’t ever cut. No holdings in the model portfolio have suspended their dividend whilst in the portfolio, but if they did I expect that the same logic would apply. However, from the type of companies that I put in the portfolio I think the odds of a dividend suspension are fairly remote (but not zero of course).